Caron Pipe Jacking bores under access road enabling Cairns Co. to install water main for garage built by Cianbro Corp. The use of horizontal boring spared the site contractor for a new parking garage at the Manchester, N.H., airport from having to open cut the busy facility's main access road. Caron Pipe Jacking Inc. of Berlin, Conn., under subcontract to George R. Cairns Co. of Methuen, Mass., bored a 66-foot-long, 24-inch-diameter hole beneath the road and installed a steel sleeve to house a water main that will provide fire protection for a new parking garage. The Cairns Co. is the site and utility contractor for the new garage, nearing completion by general contractor Cianbro Corp. of Pittsfield, Maine. According to Costos "Pappy" Papachristos, project manager for Cairns Co., the Methuen firm has been working on five contracts worth roughly $15 million at the airport over the past two years. Cairns dug the 36-foot by 12-foot by 13-foot-deep boring pit using a Cat 330, according to Papachristos. They needed the depth to clear existing utilities including storm drains and electrical conduits. To shore the pit and protect workers, the contractor installed an American Shoring Inc. SBH Slide Rail System equipped with Rolling Struts. The Slide Rail System is a vertical sheeting and trench support system, used instead of conventional wood or steel sheeting. It allows excavation to be shored from ground level to subgrade without soil movement. In practice, the contractor employs an excavator bucket to drive the grooved rails into the earth. Side panels are slipped into the grooves. In the Manchester application, Rolling Struts were used. These braces keep the slide rails apart and parallel, allow the rails to be driven to the maximum as digging proceeds, and provide ample clearance for pipe installation. According to Darren Beck, project superintendent for Cairns Co., they were impressed by the system: "It was pretty slick, how it all went together," said Beck. "A representative from American Shoring was on hand to show us how to install the system, and our crew caught on quickly to the routine. And the workers said they felt safe inside the system. It was very solid and rigid,"
Caron's project engineer for the boring was Bill Lane (now retired). Since the bottom of the pit penetrated about 1 foot into groundwater, the crew set up a sump pump inside a PVC pipe, which kept the area dry. The soil was sufficiently stable that it was not necessary to add braces or cast a concrete thrust block behind the jacks. Instead, a steel plate was simply placed at the end of the pit against the soil, according to Paul Paradis, foreman for Caron. Boring was accomplished with the use of an auger housed inside the steel casing. 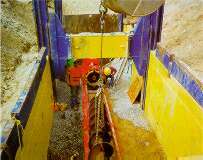 Caron used a Richmond (now American) 30-inch boring machine and two 150-ton jacks to push the casing through the soil. As the casing proceeded, the auger removed the soil from inside the casing and deposited the material into a trough that was periodically raised out of the pit and emptied in a stockpile by the Cat 330. The casing and augers came in 20-foot lengths. Casings were welded together and the auger sections were bolted together as the length of the bore increased. Caron crews installed the steel casing under the road in just 2-1 / 2 days. "At the garage, only cleanup work is left," he said. "Our biggest job is a $9.3-million project to extend and reconstruct Runway 6-24. As part of this, we're building a 590 foot-long by 20-foot-tall retaining wall using precast T-Wall sections supplied by Concrete Systems Inc. of Hudson, N.H.
©2008 Caron Pipe Jacking Inc. All rights reserved.